Lee Hee-ho, the widow of former South Korean President and Nobel Peace Prize laureate Kim Dae-jung, is escorted after speaking to the media at Gimpo International Airport in Seoul, South Korea, after returning from North Korea, Aug. 8, 2015. The 92-year-old widow of former South Korean President and Nobel Peace Prize laureate Kim Dae-jung returned to Seoul on Saturday after a four-day visit to North Korea that ended without a meeting with North Korean leader Kim Jong Un. Lee Hee-ho told reporters that she wasn't carrying out any official duty on behalf of South Korea during her trip. There was no contact from Kim Jong Un during her stay in North Korea, although he sent a message of welcome through a North Korean official who met Lee at the airport in Pyongyang on Wednesday, according to Lee's aides. Her itinerary released to the media included visits to a maternity clinic, orphanage and children's hospital, but not any formal meetings with senior North Korean officials. Some analysts had speculated there could be a chance Kim Jong Un might meet her or try to send a message to Seoul through her. Lee described meeting children at facilities in Pyongyang as an emotional experience that reinforced her beliefs that the Koreas "must not pass the pain of division to the next generation." Relations between the rival Koreas have been testy following the recent opening of a U.N. office in Seoul tasked with monitoring North Korea's human rights situation and the North's refusal to release several South Koreans detained there. 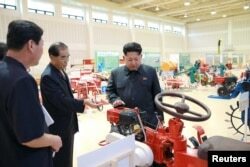 North Korean leader Kim Jong Un visits a farm machine exhibition in this undated photo released by North Korea's Korean Central News Agency (KCNA) in Pyongyang, Aug. 6, 2015. Before she left for Pyongyang, Lee expressed hope that her visit would pave the way for more exchanges between the countries. Kim Jong Un's failure to meet Lee during her North Korean stay raises further questions about his enthusiasm about improving inter-Korean ties and his skills in diplomacy, said Cheong Seong-Chang, a North Korea expert at South Korea's Sejong Institute. Kim Jong Un decided against traveling to Moscow to attend the May celebrations marking the 70th anniversary of the Soviet Union's victory over Nazi Germany and sent the country's nominal head of state, Kim Yong Nam, in his place. Kim Jong Un also snubbed Mongolian President Tsakhiagiin Elbegdorj when he traveled to North Korea in 2013 and has been rarely seen with high-profile foreign visitors other than former U.S. basketball star Dennis Rodman. Kim Dae-jung, who died in 2009, backed a policy of rapprochement with Pyongyang and held a landmark summit with Kim Jong Un's father and late North Korean leader Kim Jong Il in 2000. He won the Nobel Peace Prize later that year for his efforts. The summit talks spawned a flurry of cooperation projects, but most of them have been put on hold since conservatives took power in Seoul in 2008, and ended big aid shipments to North Korea. North Korea is particularly keen on reopening the country to South Korean tourists, along with pursuing business and investment deals with its more affluent southern neighbor. Last year, Kim Jong Un invited Lee to visit after thanking her for sending condolence flowers on the third anniversary of the death of his father. Kim Jong Un and Lee briefly met in December 2011, when Lee visited North Korea to attend the funeral of Kim Jong Il.